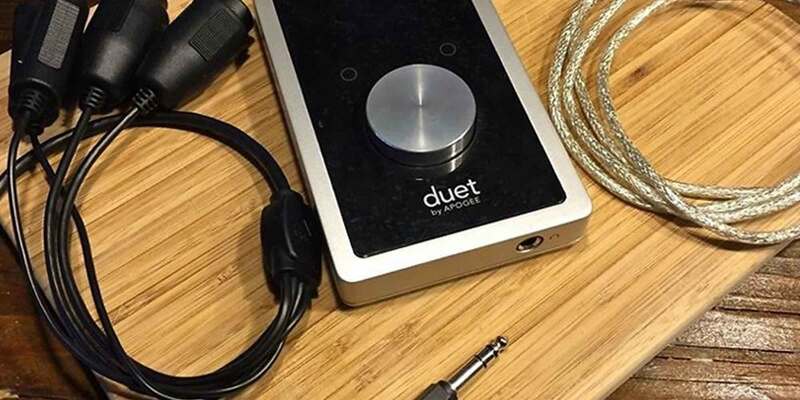 While you can certainly download any free DAW software, arm a track, hit record and play your heart out into your laptop’s built-in microphone, you need an external audio interface to step up your sound quality. An interface replaces your computer’s built-in sound card, giving you analog and/or digital inputs and outputs for microphones, electric instruments, monitor speakers, headphones and external gear to and from your computer. These interfaces come in all sorts of sizes and configurations, from smaller boxes geared for singer-songwriters who only need a couple of inputs to much larger interfaces with 16 mic preamps and onboard DSP effects. At Reverb, we’ve had the good fortune to try out a number of the industry’s current offerings, and are more than happy to give our 2 cents (well, 7 cents) as to the absolute best options in every price range. Just because you’re low on dough doesn’t mean you’ve got to be short on microphone inputs. The simplicity, amount of I/O and incredibly low price point make the Tascam US-1200 the Portastudio of the computer recording world, perfect for the hobbyist or beginner looking to dip their toe into recording their band. The US-1200 is a rackmountable USB interface compatible with both Mac and PC computers and is about as straight-forward as it gets. All of the US-1200’s inputs – four mic pres and two line/instrument inputs – happen on the front panel, making it ideal for a home or project studio where different gear is frequently being connected and disconnected. A single headphone amplifier with level control and a set of balanced outputs to connect your monitors round out the I/O. An onboard DSP mixer with software control lets you monitor with low latency, add effects in real-time, and even stream the stereo mix for live podcasting. For artists and bands that are constantly on the move, the PreSonus AudioBox 44VSL USB interface for Mac or PC is a compact solution built into a rugged enclosure with four mic inputs and PreSonus’ Studio One Artist DAW software to get you recording post-haste. The Class-A XMAX mic pres are fast and detailed with a wide gain range to cover your hottest condenser mics and your quirky old dynamics with much lower average output level. For zero-latency monitoring, the AudioBox 44VSL has a blend control that mixes the analog input signals with the playback from your DAW, getting rid of any delay inherent to doing an A/D and D/A conversion and monitoring through your software. The headphone amp is actually quite loud and clear, whereas other interfaces in this price range tend to lack “oomph” in that category. Rounded out by line outputs for connecting external gear and MIDI I/O for synths, controllers and DJ gear, the AudioBox 44VSL is about as fully-featured as you can get for an interface this small and this inexpensive. In this article, we'll talk about the two fundamental components that process sound in a recording interface, and some ways in which you can identify the quality of the gear you’re using. This is where it starts to get interesting. The Zoom UAC-8 is a USB 3.0 interface for Mac or PC with blazing fast low-latency performance and eight mic preamps that let you cut the entire rhythm section at once. This feature-laden interface packs plenty of I/O into a single rackspace, including a software-controlled DSP mixer with effects, eight analog line outputs, balanced monitor outputs, MIDI I/O for control surfaces and external MIDI gear, and digital I/O via ADAT optical and S/PDIF for a total of 18 inputs and 20 outputs. What sets the UAC-8 apart from other interfaces in this weight class, however, is the sound quality. Premium Burr Brown chips and upsampling are employed here and make for a crystal-clear, wide-open soundstage that’s characteristic of interfaces costing significantly more. This update to MOTU’s popular 896 isn’t just a standard audio interface. It’s also a standalone 16-bus digital mixer for Mac or PC with DSP effects and both Firewire and USB 2.0 connection. At this level, you get eight mic preamps with switchable pad and phantom power per channel. MOTU has notably stepped up the quality of these pres compared to the old 896HD, which got a lot of flack for sounding thin and papery. The metering here is rather extensive, with eight LED ladders for input level and eight user-assignable meters. What makes the 896mk3 an especially great value are the range of included effects and processors handled by the onboard DSP. You get an LA-2A limiter emulation, a “British-flavored” EQ, and a killer sounding reverb. The intensive CueMix FX software that powers the mixer can be controlled with an iPad over WiFi, letting you change up your mixer settings on with ease thanks to an intuitive user interface. And now we’re in Thunderbolt land. The Focusrite Clarett 8Pre X boasts incredibly low latency times thanks to this high-speed connection and is among the best values in Mac-specific audio interfaces. The star of the show here, aside from the generous I/O complement, is the sound. The switchable “Air” effect across the eight mic pres claims to emulate the high-frequency magic of the transformers in Focusrite ISA preamps, and though we were initially skeptical and brushed it off as rather gimmicky, the proof is ultimately in the aural pudding. You’ll find yourself leaving the “Air” switch in more often than not, and it’s an effect that really comes to life when it’s spread across everything that you record. It takes good-sounding preamps and makes them sound great, and it probably wouldn’t have been considered a “design flaw” to have just left it permanently engaged with no switching. The software mixer is uncomplicated but flexible, letting you route any input to a custom mix for headphones or straight to a physical output. It’s not the gigantic routing matrix that the 896mk3 or the bigger RME interfaces can give you, but for recording a band, it’s hard to beat the simplicity here. Focusrite throws in a few of the Red plugins with some offerings from Softube, and any standard DAW plugin can be monitored while recording thanks to Thunderbolt’s awesome performance. If you’re looking to expand your mic pres here, Focusrite released the Clarett OctoPre to give you the same exact mic pres with ADAT outputs to easily interface with the 8Pre X and bring you up to 16 preamps in three rack spaces. 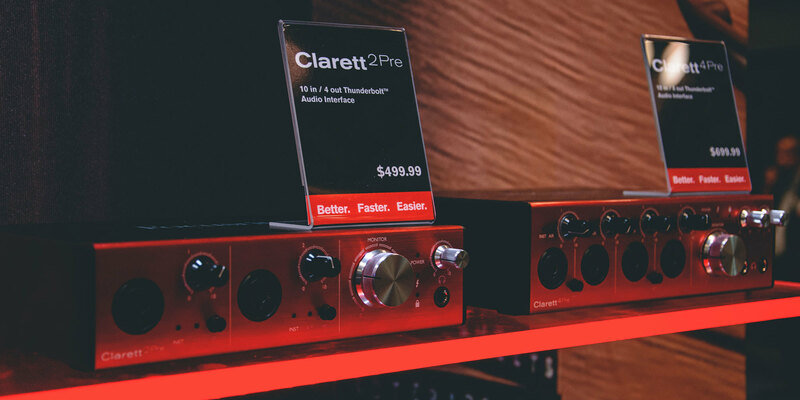 At the 139th AES Convention at the Javits Center in New York's Westside, Ben from Focusrite walked us through the new Clarett Thunderbolt line of audio interfaces. The first line of Apollo interfaces a few years back took the recording world by storm, and the second generation was welcomed with open arms. This newer version has the same I/O and general layout but adds Thunderbolt as standard (it was a pricey option card on the “silverface” models) and sports four of the latest SHARC chips. This ups the performance and processing power to handle the revered UAD plugins which seem to get better with each new release. The four mic pres have UA’s “Unison Technology,” which allows for extremely convincing mic pre modeling that changes up the impedance, gain structure and topology emulation to mimic classic console preamps. And yes, the new version does sound a bit clearer than the original, particularly on the stereo monitor outputs where the accuracy of stereo imaging seems to have been kicked up a notch or three. One of the more impressive updates to the Apollo was with the Console 2.0 software. It now allows for the cascading of up to six UAD-2 devices (four interfaces, two “Satellite” plugin hosts) for high channel-count systems. If you want more mic pres right out of the gate and don’t have outboard options, check out the Apollo 8p for eight Unison mic pres to get the entire rhythm section recorded at once. This one’s for the engineer that needs absolutely everything. The name of this interface accurately portrays what you’re getting. As of this writing, the Antelope Audio Goliath has the greatest number of inputs and outputs in this product type as well as interfacing options, with Thunderbolt, USB and a pair of MADI ports to connect to virtually any modern computer rig. Front panel control for the gain on 16 mic pres and 4 instrument inputs is augmented by an impressive touchscreen interface with 32 channels of metering. The D/A converter on the stereo monitor outputs is mastering-grade, and not just in marketing speak. It sounds stunning, and offers up a mighty 129dB of dynamic range, a spec you’ll generally find only in the priciest dedicated D/A converters. The instrument inputs with amp and mic modeling sound splendid, too, rivaling the the highest-end hardware modelers used by professional touring guitarists and session musicians. If for whatever reason you feel the modeling is lacking for a particular track, the Goliath gives you two reamp outputs to let you take these direct tracks into your favorite amp and pin down your tones after the fact. Onboard DSP supports Antelope’s new line of powered plugins that model a range of microphones, amps, cabinets, EQs and compressors with the promise of many more on the way. Antelope’s focus on highly-accurate clocking shows no signs of waning, with 64-bit jitter management and a 10M input for the company’s hilariously expensive Atomic Clock.